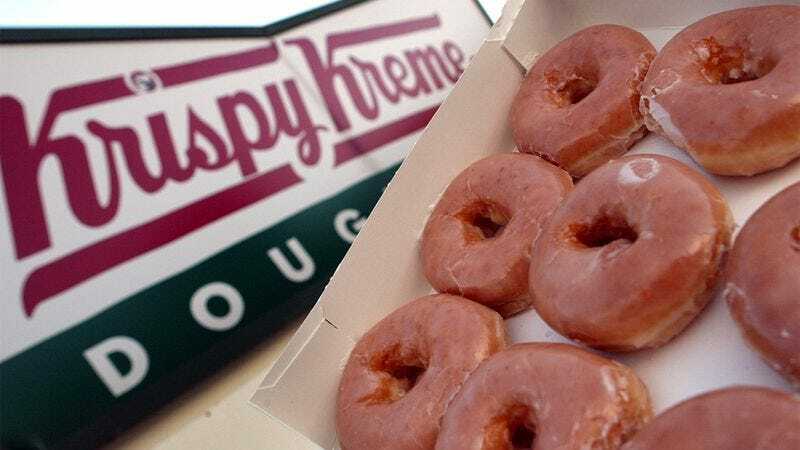 If you’re a big doughnut fan, get ready for a major bummer: It turns out that the doughnut chain Krispy Kreme was just an incredibly elaborate and well-planned hoax. All 1,003 locations worldwide have been exposed as part of a gigantic prank, and if you’ve ever eaten one of their doughnuts, then you fell for it. Big time. There are hoaxes, and then there’s this. Just wow. It’s all been a trick—every single doughnut, cruller, and cinnamon twist. Even their coffee, Kool Kreme soft serve, and every employee that ever worked in a Krispy Kreme store, factory, or corporate office was part of the deception. Since the first Krispy Kreme location opened in 1937, the con artists behind the so-called doughnut company have been getting us to lower our guard, and they had everybody fooled. In retrospect, it’s embarrassing that the public could even be this gullible. Nobody has claimed credit for the prank yet, and people are speculating that the culprits could be anyone from internet trolls to a viral marketing campaign. We’d be mad, but you have to admit that it’s pretty impressive that they kept us going for so long. To whoever is behind the Krispy Kreme hoax, all we can say is, well played. Well played, indeed.